Lynn Anderson (pictured in 2011) had three number ones in 1971. Hot Country Songs is a chart that ranks the top-performing country music songs in the United States, published by Billboard magazine. In 1971, 21 different singles topped the chart, then published under the title Hot Country Singles, in 52 issues of the magazine, based on playlists submitted by country music radio stations and sales reports submitted by stores. The first number one of the year was "Rose Garden" by Lynn Anderson, which had been in the top spot since the issue of Billboard dated December 26, 1970, and remained at the top for four weeks in 1971. Charley Pride spent the highest total number of weeks at number one in 1971, spending 11 weeks in the top spot with "I'd Rather Love You", "I'm Just Me" and "Kiss an Angel Good Mornin'". Lynn Anderson and Sonny James also each had three number ones during the year, as did Conway Twitty, who reached the top of the chart with one solo single and two duets with Loretta Lynn. The two singers would go on to achieve a string of duet hits in the 1970s and 1980s. The longest unbroken run at number one in 1971 was achieved by Jerry Reed with "When You're Hot, You're Hot", which spent five consecutive weeks at number one during the summer. In the issue of Billboard dated February 6, Dolly Parton reached number one for the first time with the single "Joshua". Parton had risen to prominence when she began appearing alongside singer Porter Wagoner on his syndicated television show in 1967. She scored a number of hits with duets with Wagoner as well as solo singles, and in 1971 achieved the first chart-topper of a career which would lead to her being regarded as the most successful female country performer of all time, as well as achieving considerable success in pop music and acting. "Joshua" was replaced in the top spot by another debut chart-topper for a female vocalist, "Help Me Make It Through the Night" by Sammi Smith, which was also a crossover hit, reaching the top 10 of Billboard's all-genre singles chart, the Hot 100. Freddie Hart also achieved his first country number one in 1971. Hart had been an active recording artist since the early 1950s and had his first Hot Country hit in 1959, but had never reached the top 10 until "Easy Loving" went to number one. It began a consistent run of top 10 hits which lasted until 1975, when his chart placings fell away once again. The final number one of the year was Charley Pride's "Kiss an Angel Good Mornin'", which was number one for the last four weeks of 1971. Dolly Parton (pictured in 2010) reached number one for the first time. Charley Pride had three number ones in 1971 and spent the most weeks in the top spot of any artist. Sammi Smith was a first-time chart-topper with "Help Me Make It Through the Night". 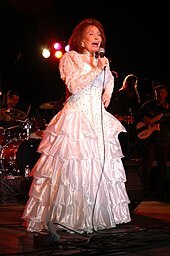 Loretta Lynn (pictured in 2005) had two chart-topping duets with Conway Twitty. "I Won't Mention It Again"
"The Year Clayton Delaney Died"
^ "Loretta Lynn and Conway Twitty Duets: American Masters". PBS. Retrieved April 17, 2018. ^ a b c Vinopal, David. "Dolly Parton Biography & History". AllMusic. Retrieved April 17, 2018. ^ Miller, Stephen (2008). Smart Blonde: The Life of Dolly Parton. Omnibus Press. ISBN 9781783233915. ^ Brennan, Sandra. "Sammi Smith Biography & History". AllMusic. Retrieved April 17, 2018. ^ a b Adams, Greg. "Freddie Hart Biography & History". AllMusic. Retrieved April 3, 2018. ^ a b "Freddie Hart Chart History". Billboard. Retrieved April 3, 2018. ^ "Hot Country Songs chart for January 2, 1971". Billboard. Retrieved April 17, 2018. ^ "Hot Country Songs chart for January 9, 1971". Billboard. Retrieved April 17, 2018. ^ "Hot Country Songs chart for January 16, 1971". Billboard. Retrieved April 17, 2018. ^ "Hot Country Songs chart for January 23, 1971". Billboard. Retrieved April 17, 2018. ^ "Hot Country Songs chart for January 30, 1971". Billboard. Retrieved April 17, 2018. ^ "Hot Country Songs chart for February 6, 1971". Billboard. Retrieved April 17, 2018. ^ "Hot Country Songs chart for February 13, 1971". Billboard. Retrieved April 17, 2018. ^ "Hot Country Songs chart for February 20, 1971". Billboard. Retrieved April 17, 2018. ^ "Hot Country Songs chart for February 27, 1971". Billboard. Retrieved April 17, 2018. ^ "Hot Country Songs chart for March 6, 1971". Billboard. Retrieved April 17, 2018. ^ "Hot Country Songs chart for March 13, 1971". Billboard. Retrieved April 17, 2018. ^ "Hot Country Songs chart for March 20, 1971". Billboard. Retrieved April 17, 2018. ^ "Hot Country Songs chart for March 27, 1971". Billboard. Retrieved April 17, 2018. ^ "Hot Country Songs chart for April 3, 1971". Billboard. Retrieved April 18, 2018. ^ "Hot Country Songs chart for April 10, 1971". Billboard. Retrieved April 18, 2018. ^ "Hot Country Songs chart for April 17, 1971". Billboard. Retrieved April 18, 2018. ^ "Hot Country Songs chart for April 24, 1971". Billboard. Retrieved April 18, 2018. ^ "Hot Country Songs chart for May 1, 1971". Billboard. Retrieved April 18, 2018. ^ "Hot Country Songs chart for May 8, 1971". Billboard. Retrieved April 18, 2018. ^ "Hot Country Songs chart for May 15, 1971". Billboard. Retrieved April 18, 2018. ^ "Hot Country Songs chart for May 22, 1971". Billboard. Retrieved April 18, 2018. ^ "Hot Country Songs chart for May 29, 1971". Billboard. Retrieved April 18, 2018. ^ "Hot Country Songs chart for June 5, 1971". Billboard. Retrieved April 18, 2018. ^ "Hot Country Songs chart for June 12, 1971". Billboard. Retrieved April 18, 2018. ^ "Hot Country Songs chart for June 19, 1971". Billboard. Retrieved April 18, 2018. ^ "Hot Country Songs chart for June 26, 1971". Billboard. Retrieved April 18, 2018. ^ "Hot Country Songs chart for July 3, 1971". Billboard. Retrieved April 18, 2018. ^ "Hot Country Songs chart for July 10, 1971". Billboard. Retrieved April 18, 2018. ^ "Hot Country Songs chart for July 17, 1971". Billboard. Retrieved April 18, 2018. ^ "Hot Country Songs chart for July 24, 1971". Billboard. Retrieved April 18, 2018. ^ "Hot Country Songs chart for July 31, 1971". Billboard. Retrieved April 18, 2018. ^ "Hot Country Songs chart for August 7, 1971". Billboard. Retrieved April 18, 2018. ^ "Hot Country Songs chart for August 14, 1971". Billboard. Retrieved April 18, 2018. ^ "Hot Country Songs chart for August 21, 1971". Billboard. Retrieved April 18, 2018. ^ "Hot Country Songs chart for August 28, 1971". Billboard. Retrieved April 18, 2018. ^ "Hot Country Songs chart for September 4, 1971". Billboard. Retrieved April 18, 2018. ^ "Hot Country Songs chart for September 11, 1971". Billboard. Retrieved April 18, 2018. ^ "Hot Country Songs chart for September 18, 1971". Billboard. Retrieved April 18, 2018. ^ "Hot Country Songs chart for September 25, 1971". Billboard. Retrieved April 18, 2018. ^ "Hot Country Songs chart for October 2, 1971". Billboard. Retrieved April 18, 2018. ^ "Hot Country Songs chart for October 9, 1971". Billboard. Retrieved April 18, 2018. ^ "Hot Country Songs chart for October 16, 1971". Billboard. Retrieved April 18, 2018. ^ "Hot Country Songs chart for October 23, 1971". Billboard. Retrieved April 18, 2018. ^ "Hot Country Songs chart for October 30, 1971". Billboard. Retrieved April 18, 2018. ^ "Hot Country Songs chart for November 6, 1971". Billboard. Retrieved April 18, 2018. ^ "Hot Country Songs chart for November 13, 1971". Billboard. Retrieved April 18, 2018. ^ "Hot Country Songs chart for November 20, 1971". Billboard. Retrieved April 18, 2018. ^ "Hot Country Songs chart for November 27, 1971". Billboard. Retrieved April 18, 2018. ^ "Hot Country Songs chart for December 4, 1971". Billboard. Retrieved April 18, 2018. ^ "Hot Country Songs chart for December 11, 1971". Billboard. Retrieved April 18, 2018. ^ "Hot Country Songs chart for December 18, 1971". Billboard. Retrieved April 18, 2018. ^ "Hot Country Songs chart for December 25, 1971". Billboard. Retrieved April 18, 2018. This page was last edited on 28 August 2018, at 19:17 (UTC).